The field labour ratio is one of the most important key performance indicators for any landscape company because labour has more impact on profitability than any other cost in your company. Succession planning began much sooner than expected for Kevin Forestell. 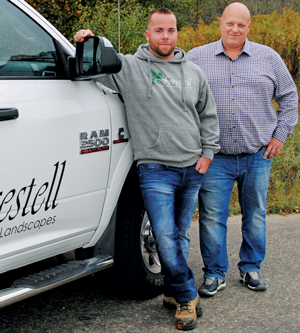 By his mid-30s, he had built, alongside his wife Erin Stephenson and brother Tim, a successful full-service landscape company, Forestell Designed Landscapes (FDL), with offices spanning across Ontario and out east in Charlottetown, P.E.I. However, Forestell’s career path took a dramatic turn in 2015 when the trio launched Dozr, an online peer-to-peer marketplace, where contractors seeking specific pieces of equipment can rent it from other contractors, who are not using it at the time. The two parties agree on the price and Dozr gets a commission. Dozr also assists users by providing contracts that set out the terms of the rental agreement, as well as taking care of the payment process and insurance. Like other tech sharing-economy platforms including Airbnb and Uber, Dozr includes a rating system that enables customers to see evaluations of both the equipment owners and those renting the equipment. The Waterloo, Ont.-based venture was a hit, attracting investors from across North America and winning $100,000 at Communitech Rev Accelerator contest in the spring of 2016. The success put Forestell in a tough position: passionate about the landscape profession and concerned about the well-being of his employees, cashing out was never the goal when he started the company in 2003. He also recognized how difficult it can be to find a buyer and to reach financial terms that would be agreeable to both parties. However, it soon became clear that in order to seize upon Dozr’s enormous potential, he needed to devote his full, undivided attention to his latest venture. In 2016, they began looking for potential buyers, starting first with the Landscape Ontario community. The scope of business and the territory it covers, (offices in Guelph, Collingwood, Waterloo, Barrie, Milton, Brockville, Owen Sound, Ottawa and Charlottetown) provided another hurdle to finding the right buyer. FDL ranged from 150 employees during the summer months to 400 during the winter. Having grown to such a large scale, Forestell and his family had been very successful in developing a recognized brand. Now they wondered how they would be able to monetize it. Client lists, contracts, equipment and real estate obviously have a tangible value, but how do you put a price on a company’s reputation? sacrifices to build the company. Selling the business was “an emotional rollercoaster” at times. “l had literally worn a Forestell Designed Landscape shirt every day for 13 years,” Forestell says. They considered breaking the business up into individual cities or regions, but that process would take even more time, something they couldn’t afford to lose. After exploring the market with other landscape business owners, and even looking into utilizing an investment bank or company like Deloitte to sell the company for them, Forestell realized there was another option staring him right in the face. Why not sell to a current employee who already knows the business and has a great relationship with its employees and clients? Mason Tresnak had been in the landscape profession for a decade, including four years with FDL. He started with the company as the regional manager in Barrie, before transitioning to regional manager of the head office in Guelph and ultimately managing numerous satellite offices as well. Young, motivated and well respected by staff members, Tresnak was an ideal candidate to take on more responsibility. The first step was for Tresnak was to get his own legal counsel. Mixing business and friendship can be a difficult balance, however, the pair were able to stay on the same page while getting the legalities nailed down. It was an exciting opportunity for Tresnak, who was eager to put the lessons he had learned from Forestell into action and do his best to keep the company on its upward trajectory. “I think because I was around the company in a management position, I was the highest position that wasn’t a member of the Forestell family, and also because I am so hands on and out in the field every day, I had great relationships with all of our employees,” Tresnak says. Ownership transitions can make staff members anxious about their job security, but both Forestell and Tresnak were sensitive to that fact and did their best to quell anxiety and to reassure everyone that it would be a smooth transition. Tresnak also worked hard to ensure clients weren’t impacted negatively by the change; in fact, no contracts were lost. Forestell agrees. “It was really great for the customers, because now the employees that they already knew and liked were becoming even more invested and motivated to do an even better job,” he says. With their deal in the rear view mirror, both Forestell and Tresnak have had time to reflect on the lessons they learned through the process. For Forestell, the biggest takeaways were the amount of time, energy and money it takes to sell.